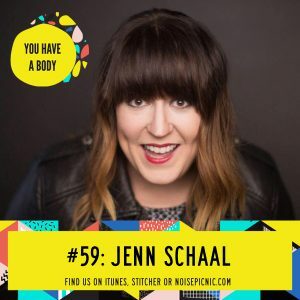 This week Lucia interviews Jenn Schaal, comedian, powerlifter, and rocking human who is thoughtful, smart as a whip and showing everyone how she lives her best life. Guess what helps fuel her? Kimchi and deadlifts. Yep. Oh, and her dog Louie, too! Listen on to learn about how she came to fitness and just how much that one choice has impacted the rest of her life. Oh yeah, we’re (well, Lucia is…) getting sappy over here! Like what you’re hearing? Great! Leave us a review in iTunes and we’ll send a personal shout out on an upcoming episode to you! Find Jenn @jennschaal on Instagram and her dog Louie @ouiouilouie there, too!